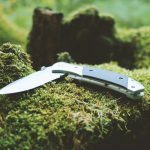 Home » Knives » Best Assisted Opening Knives 2019 For The Money? The entire base of an assisted opening knife is convenience and speed. 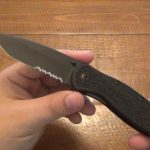 Assisted knives were introduced to the market to give knife enthusiasts a knife that was quick to deploy, safe to handle, and most importantly – legal in the United States Before we get into the actual topic, lemme introduce myself! These assisted knives offer a quick and convenient way to handle your everyday tasks or chores. I've kept the article short but very interesting and informative so that it doesn't bore you. I recommend you reading this article completely to make a better purchase. Kershaw is a giant in the knife industry. The quality and variety they bring to the table for knife enthusiasts are commendable. 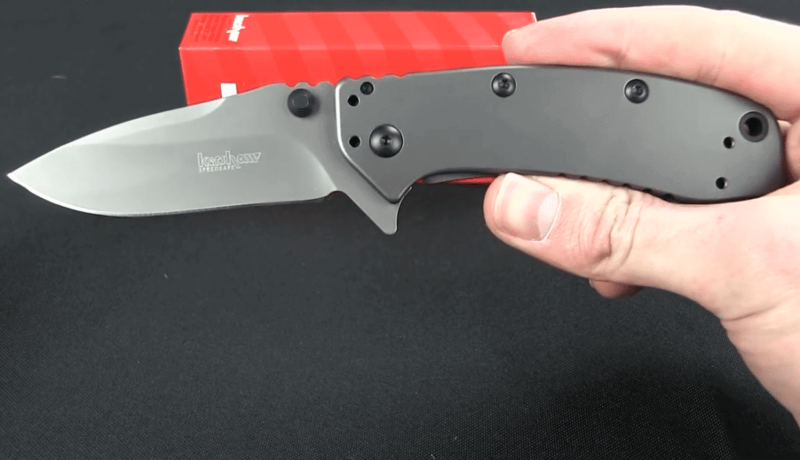 Kershaw Cryo || is our first pick for the spring assisted knife. If you're tight on the budget, then look no further, grab the Kershaw Cryo 2. The assisted action of Cryo || is as smooth as butter, perfectly solid lock up, nicely ground blade that don't require frequent sharpening & have a great deep carry clip. The handle is simple and feels good in the hands, but it makes an average grip. It's a decent knife with the best value for the money. And, Kershaw Cryo || weights a little heavy and need work on the handle to make a better grip but for the price point it does the justice. It's also one of our best pocket knives since 2016. 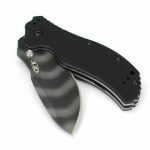 ​Kershaw Ken Onion Leek is an ideal size EDC assisted knife with 3 inches blade. Its design is very slim and sleek. 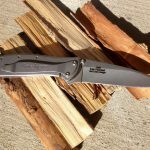 Unlike Kershaw Cryo ||, it is built in the USA. The drop point blade design makes it compatible for the detailed work. Kershaw Leek is razor sharp out of the box. The assist function operates well but takes a little bit to get used to. The reversible pocket clip makes it convenient for everyone. The stainless steel, size, and all other attributes make it a great knife overall. ​The assist function is a little bit tricky. If the lock is left off, the opening mechanism will act like a switchblade blade which might get you in trouble because it will open faster than your expectation so you might end up getting a cut on your finger. ​Kershaw Ken Onion Blur is a multitasking knife because of its blade's design. The blade is slightly curved at drop point which makes compatible for slicing and piercing at the same time. 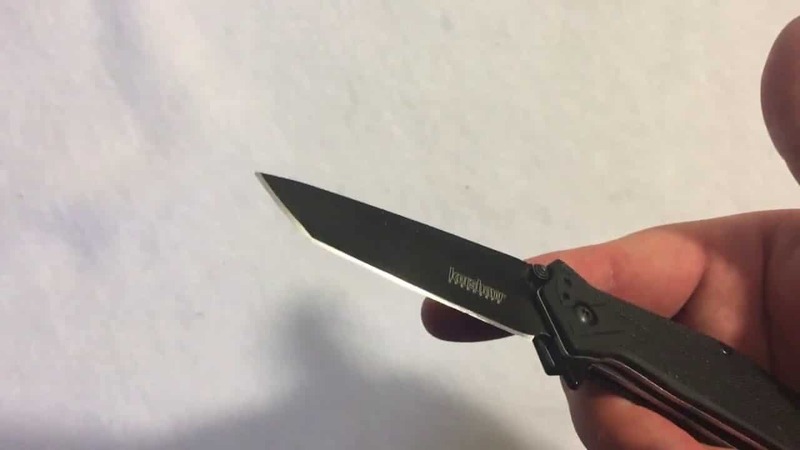 Kershaw Ken Onion Blur comes with the plain edge and serrated edge (both prices are different). Kershaw Ken Onion Blur has two blade versions, serrated edge assisted knife and plain edge assisted knife. Blur has a very sharp blade, and the handle makes the right amount of traction, unlike Ken Onion Blur. Edge retention is incredible and assisted opening mechanism is incredibly smooth. ​Overall, I love Ken onion blur, but one thing people and I hate about Ken Onion Blur is the pocket clip. It's not tight; you might have to tighten it up frequently. I would recommend carrying Blur in the front pocket because of clip. ​SOG Aegis AE02-CP is a small spring assisted knife constructed with straight edge blade. If you don't like Kershaw, for whatever reason, then SOG in another reliable and popular knife brands that you can optin for. Despite being small and light, the build quality is appreciable. It opens quickly and smoothly, I'm using it for a year now, and the spring assisted still works fine. The blade is sharp and built of quality AUS-8 stainless steel which can cut through fish, apple, and box like a cake. 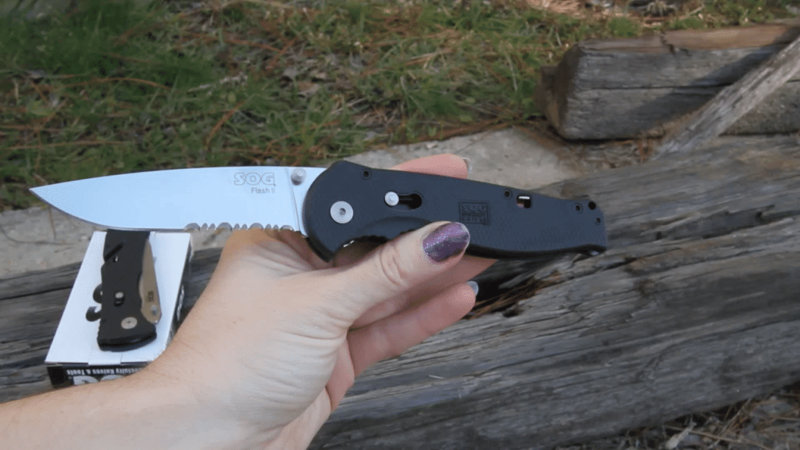 SOG Flash is an inexpensive knife. SOG Flash II is bang for the bucks with attributes like lightweight, excellent ergonomics, and spring opening mechanism. If you're tight on the budget, then look no further other than SOG Flash II. 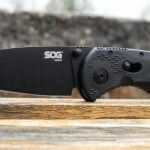 SOG flash is a cheap assisted opening knife with decent quality. 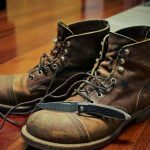 The steel and the blade is definitely not comparable to the top models, but it does the job nicely for regular everyday chores like cutting rope, slicing through vegetables, and opening boxes. 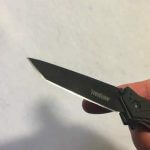 The Gerber Covert is Backed by the speed of F.A.S.T technology, which is used for quick one-hand opening deployment of the titanium-coated blade and G-10 handles that give you a tacky grip (G-10 is my favorite material for handle). If you need a serious one hand assisted opening knife, then Gerber Covert is what I would recommend to you. It is extremely fast and reliable as compared to models mentioned above. The handle is constructed of a G-10 material which provides solid grip and nice ergonomic feel. 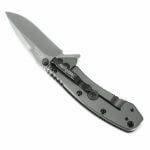 ​Smith & Wesson SWMP4L is a large assisted knife built for military and police, i.e., tactical work. 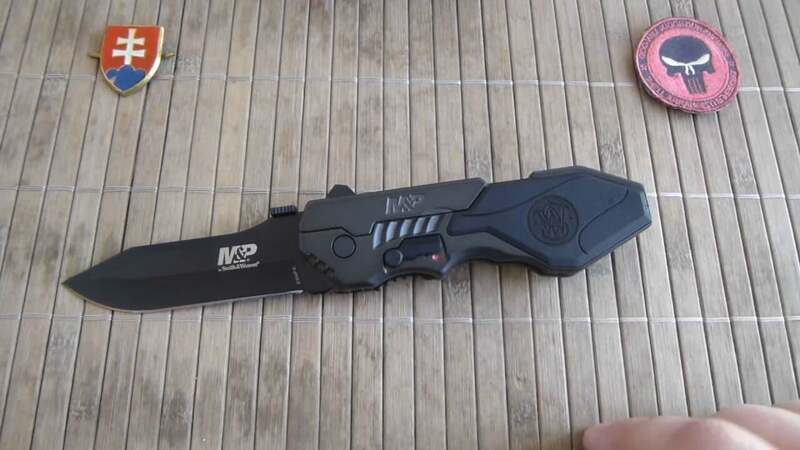 This knife is big and bulky and can be used to break the window of a car. If you need a knife for medium duty tasks, then this knife is what I would recommend you. 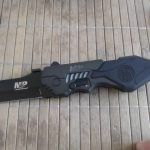 SWMP4L is a part of M&P (Military and Police) series; therefore, making it a combat knife. It features a glass breaker tip. The blade comes sharp and retains the edge for a good time. It can be used for small and medium heavy weight tasks. The opening mechanism is just MAGIC. 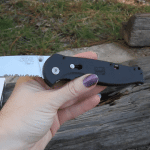 This knife is super durable which makes it more convenient to be on this list. ​Zero Tolerance has to be in my list, undoubtedly. 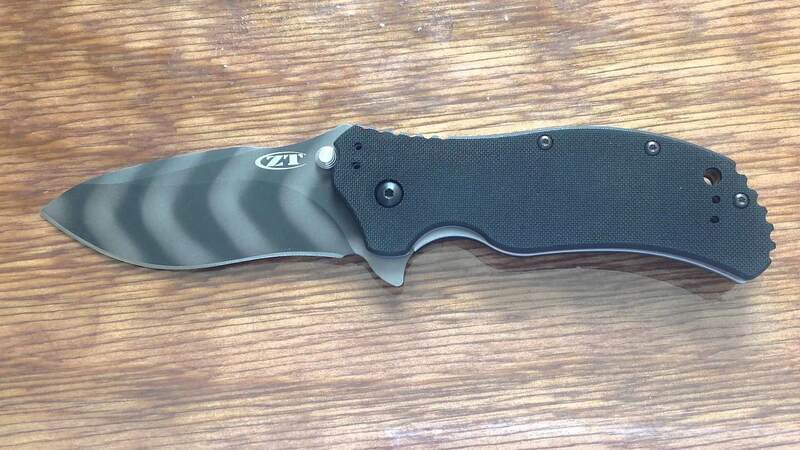 ZT0350TS is a plain edge assisted knife, and the updated version of Zero Tolerance ZT0350TS is 10% smaller and lighter than original; non-serrated blade with Tiger Stripe finish (I've purchase it; currently testing it). If you need a high-end assisted knife as a pocket or EDC knife then this knife is what you need. This knife has a razor-sharp blade; great finish which makes it durable against scrapes and its wears nice. The flipper lets you open the knife with one hand smoothly. The handle is consist of G-10 which will give you very nice grip and ergonomic feel. It's little hard to sharpen the blade as compared to other blades unless you're a very experienced sharpener. The spring wears out with time, for me, but limited lifetime manufacturer's warranty saved me.​ The newer version is still in testing and so far everything is good. Spring assisted knife is a unique pocket knife because it comes with a bottle opener drop point blade. I'm not really sure how would you react to it, but I've it in my collection, and I used it for like six months regularly and still use it. 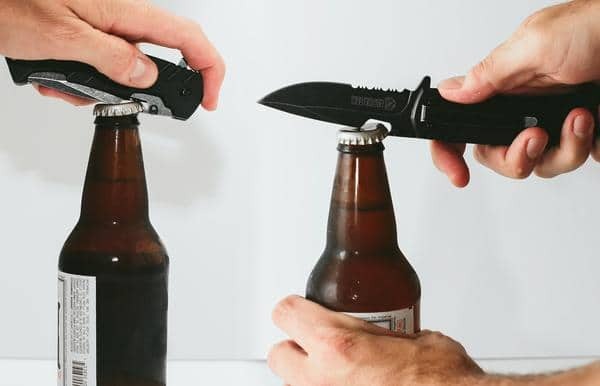 If your work includes bottle opening, then this knife is for you. The blade is tough, and the knife feels sturdy. Spring assisted works great, blade opens very smoothly. 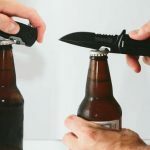 The blade design is constructed in a way that people can open the cap of the bottle, and it works both ways, i.e., opened and closed. Since it's a high carbon steel knife, therefore it will rust quickly, but if you live in the hot climate, then it shouldn't bother you. 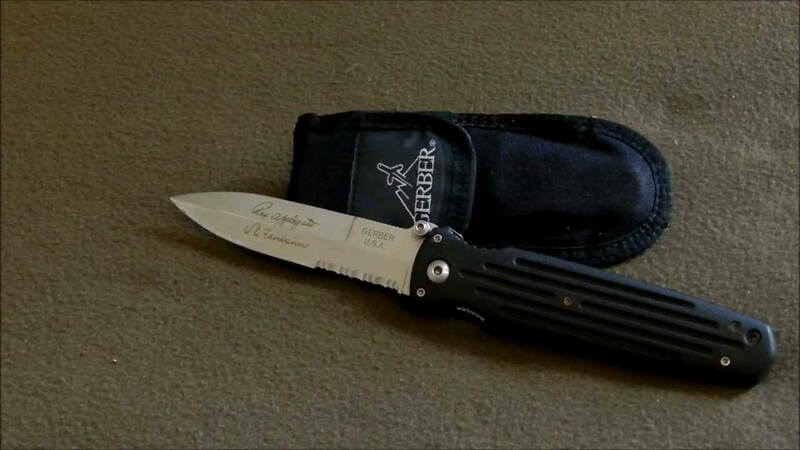 The other downside is the serration, serrations tear and don't cut.​ By the way, you can check here the list of carbon steel pocket knives. 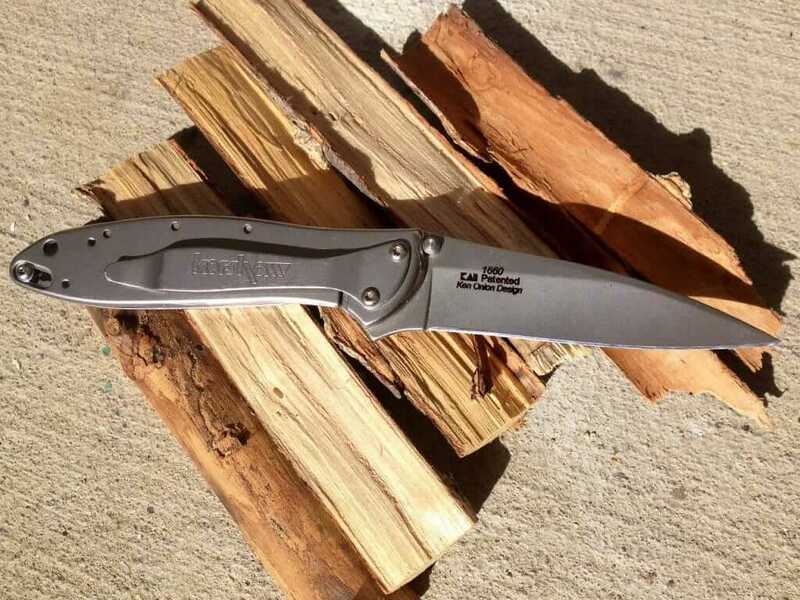 ​If your budget is little to no, then Kershaw 1990X Brawler is my top pick for you. I know you can find more models for the low price but believe me the spring will come out quickly and those knives will be very fragile. Kershaw 1990x would be the right choice if your budget is meager and you won't be using it on a daily basis. The knife is very built; everything is screwed tightly and correctly. 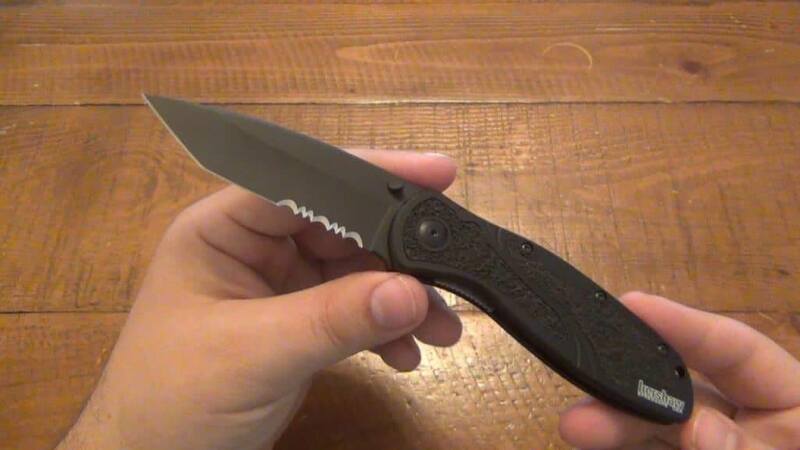 It makes a decent grip for people with small hands so you can consider it more of a female pocket knife. ​Everything about this knife is decent, don't expect much. The assisted opening works great, but it is quite fragile. The blade is sharp, but it will rest quickly because of 8Cr13MoV steel. Thumb stud or blade button – these implements allow for fast, one-handed opening of assisted knives and are used to begin the blade opening process. A spring or lever is then automatically engaged to complete the blade’s travel through the full opening arc. Thumb studs make knife opening quite simple, while blade buttons accomplish the same process via a slightly different hand motion. ​A variety of blade designs – Assisted knives are varied in their blade offerings. If you’re looking for an assisted knife to use as an everyday carry option (EDC), a semi-serrated model with a drop point or clip point blade may serve you well. 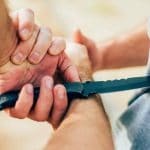 Those with more specific needs may want to investigate available blade options like rescue/safety blades, full serrated options, dagger point, utility blades, or Tanto options. ​Lightweight construction – These knives are usually designed to be deployed quickly and complete everyday tasks with ease. Essentially these knives are not constructed for heavy chores like you’d experience during a camping trip, but they are perfect for cutting rope, opening packages, and appropriate defensive maneuvers. Durability: This is the important aspect to consider before you make a purchase. The durability of the knife is measured by how well it performs or maintains its quality over the time after being used for a long time. All the blades we mentioned above have excellent durability power because these blades are made up of quality steel. These blades will work for a long time and will not damage quickly. These blades used for best assisted knives are super durable. Remember, exception is always there. I've listed the downside of each knife so if you like a knife then read my views about it. Size: Well, size always varies person to person. Few people have got small hands and few big. But, the size for best assisted opening knives is usually around 3 inches. The knives I mentioned above is listed for everyone. So, there is something for everyone. I hope that you found a knife for yourself. If you want me to mention any knife then drop a comment below. And, if you have any question then feel free to comment, I'll reply as soon as possible. I prefer Kershaw Ken Onion Leek because its overall size is very handy and blade length is just fine. I always been Kershaw’s fan girl. Thank you, Brandon! Lucio, yup its absolutely durable for light and medium tasks. Expect life span of 2-3 years with light use. you’re welcome! Good Review. Appreciate the summary including blade length. 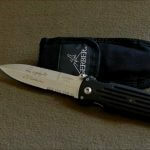 Just may pick up a Gerber Cover due to your review.